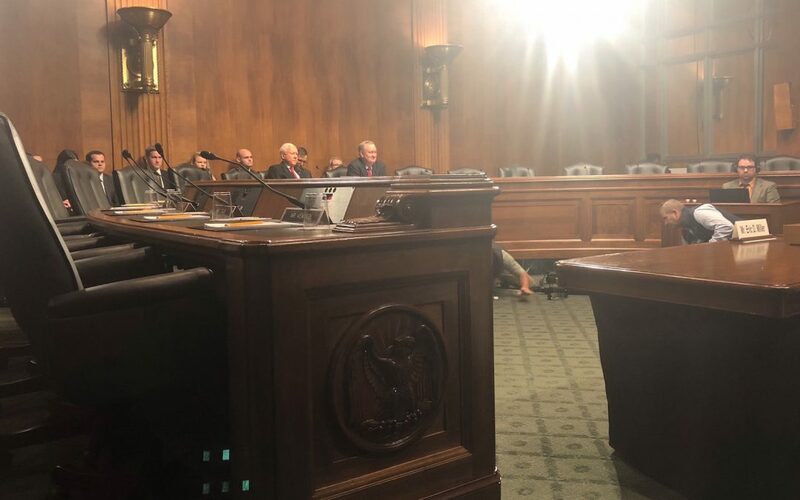 WASHINGTON – Even though the Senate is on recess, the Senate Judiciary Committee continued confirmation hearings for federal judge nominees for the 9th U.S. Circuit Court of Appeals, Federal Claims Court and the U.S. District Court in Oregon. Republican Sens. Orin Hatch of Utah and Mike Crapo of Idaho were the only members to attend the hearing. Crapo said the committee wanted to move nominations as quickly as possible for the sake of the nominees as well as to lessen the backlog of vacant seats. He said the committee hoped to have the two appeals court nominees as well as the two others confirmed by the end of the year. Crapo’s first question for the 9th Circuit nominee, Eric D. Miller concentrated on tribal issues. Crapo stated that “concern has been raised” regarding Miller’s approach to tribal sovereignty and tribal rights and that “a number of cases have been brought to” the committee’s attention. Miller affirmed his belief in the sovereignty of Native American tribes and tribal rights to only two members of the committee on Wednesday. Last year Miller argued before the United States Supreme Court for the Lewis v. Clarke case. Through Miller’s efforts, the Supreme Court ruled that the sovereign immunity of an Indian tribe does not bar damages actions against tribal employees. In another case, Miller obtained a decision from the U.S. Court of Appeals for the 10th Circuit that invalidated the Secretary of the Interior’s regulations to tribal gaming when a state and an Indian tribe have not agreed to a gaming compact. Miller stressed his impartiality by highlighting his independent career and legality of tribal sovereignty. Miller said as a judge he would not advocate for either side but follow the letter of the law. In accordance with the law, Miller mentioned tribal treaties as a sign of good faith an impartiality. The hearing adjourned just before a full hour passed. Since Crapo and Hatch were the only members present, the record for the committee will stay open for one week to allow absent senators to submit questions to the nominees.